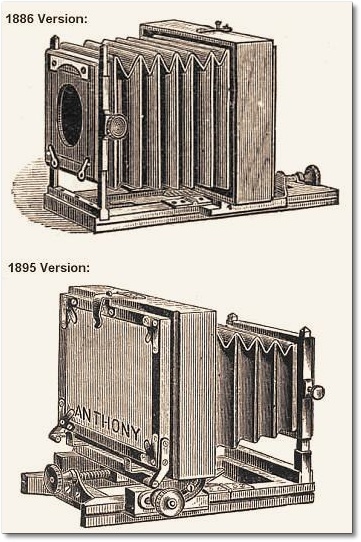 The Clifton Camera is one of Anthony's later field view models made in six sizes from 5 x 7" to 14 x 17". Although more conservatively designed in comparison to earlier Anthony models, the Clifton Camera is compact, lightweight and a surprisingly versatile, fully matured field camera. By 1906, a "Long Focus" model was offered. Features include a reversing back, double-swing front and rear standards, and front or rear focusing. Unlocking the lensboard for tilting is done by squeezing a pair of brass knobs built into the front standard. The 5x8" model shown here is made of finely polished mahogany and cherry woods, brass fittings and red leather bellows. A Fowler & Slater "The Special" rapid rectilinear lens is mounted. In 1903, this camera sold for $17 (approximately $325 in year 2000 currency).